Last week we brought you a close up look at the Montblanc 1858 Pocket Watch LE 100- the first in a series of new pieces dedicated to the great outdoors and the spirit of mountain climbing. Today, we go hands on with the Montblanc 1858 Monopusher Chronograph LE 100 — and it is a beauty. Measuring 40mm in diameter, the new Montblanc 1858 Monopusher Chronograph LE 100 with manual winding, powered by the Montblanc Caliber 13.21 is a bold beauty from inside out. On the inside, the Minerva Caliber M13.21, which has been used in some of the brand’s beloved complexities (including the Heritage Pulsograph), is a beautiful column-wheel chronograph. Based on the M 13.20 caliber (29mm) that was built and produced in 1920, the mono-pusher chronograph has a three-step control mechanism, and the hairspring and balance are made in-house by Minerva, ensuring top quality. On the outside, the watch is also a stunner. 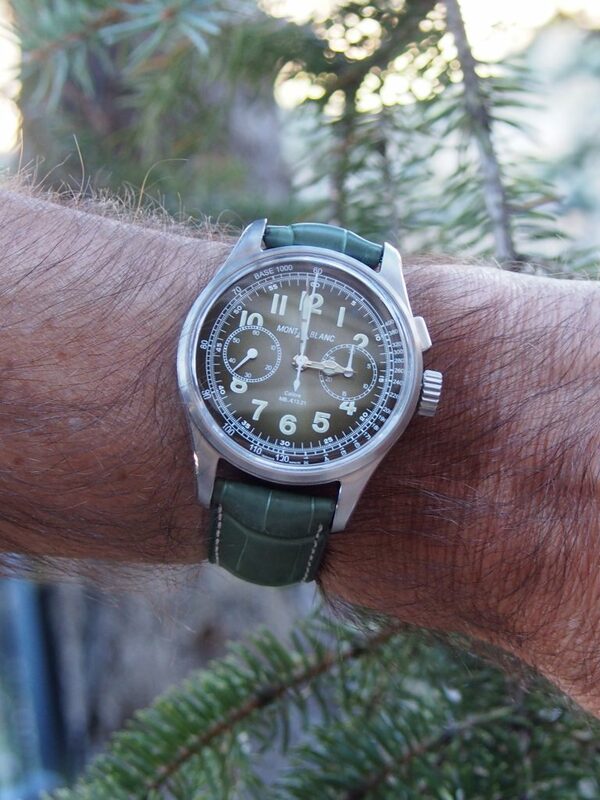 Crafted in stainless steel the Montblanc 1858 Monopusher Chronograph LE 100 features a vintage green dial with tan colored numerals and dial accents. The dial has a degrade’ sunray pattern that is lighter in the center and goes darker as it reaches the edges. The light brown hands are coated with Super LumiNova for easy night reading. 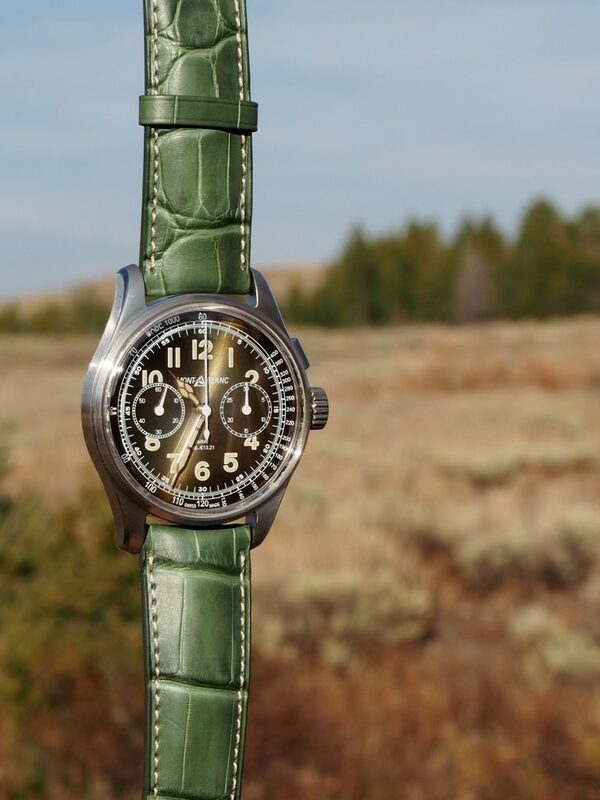 The watch is finished with a striking matching green alligator “sfumato” strap from the brand’s Firenze Pelletteria, and has tan stitching for an overall genuine vintage appeal. SIHH 2018: Just 100 pieces of the Montblanc 1858 Monopusher Chronograph LE 100 will be made, each retailing for about $28,000. Water resistant to 100 meters, this watch – like all Montblanc timepieces – has undergone the brand’s extensive 500 Hours testing and is certified as such. 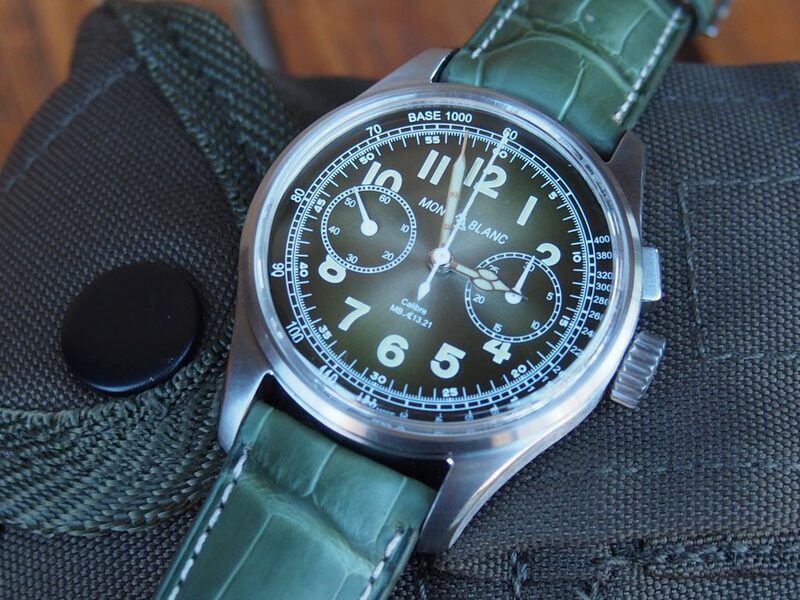 The only down side to the Montblanc 1858 Monopusher Chronograph LE 100 is the fact that just 100 pieces of this green dream will be made – each retailing for Euro 28,000.